The Music Library wishes to express our greatest gratitude to Professor Daniel Chua, Professor of Music at HKU, for his generous donation of a music parchment. We are also deeply indebted to Professor Masakata Kanazawa for his time and effort to transcribe the piece into modern notation. The First Sunday of Advent is performed on the fourth Sunday before Christmas in the Catholic Church, sung by a choir in Latin or local languages. 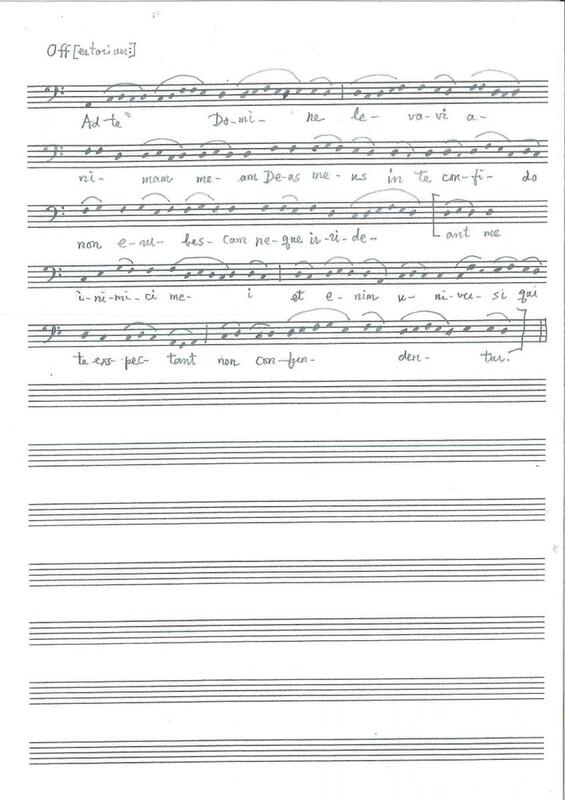 The piece is a single vocal melodic line and sung without accompaniment or harmonic support. A monophonic tone and free rhythm create solemn atmosphere when it is heard inside the church. 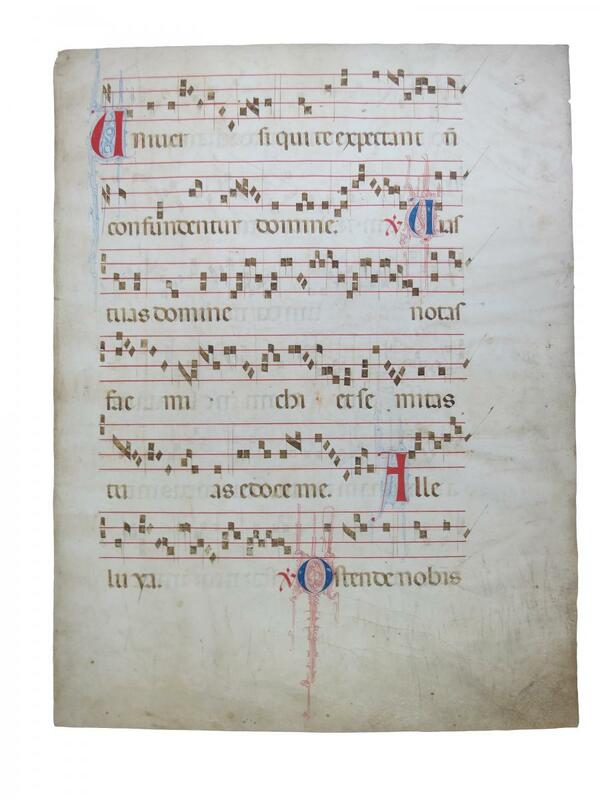 This folio is the second folio (or pages 3 and 4) of Graduale Romanum, a collection of chants for Proper Parts of Mass (Proprium missae) of the Roman Liturgy, a very typical choir book of the time. Physically, the choir book is so large that could be opened on a lectern and be seen by a large number of choir members standing some distance away. 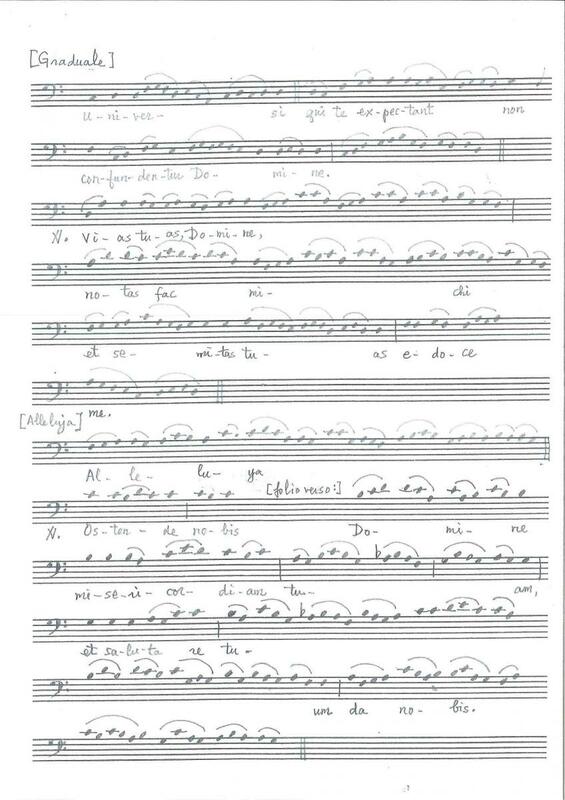 The donated manuscript features Graduale, Alleluia and the first half of Offertorium. Latin and English are provided here for reference. Milczarek, Piotr. “Dominica Prima Adventus - Graduale - Universi qui te exspectant.” 22 November 2011. Online video clip. YouTube. Accessed on 15 April 2014. Before joining Hong Kong University as Professor of Music and Head of the School of Humanities in 2008, Daniel K. L. Chua, was a fellow and the Director of Studies at St John’s College, Cambridge, and later Professor of Music Theory and Analysis at King’s College London. The manuscript was purchased in Portobello Market, London, 2002. Professor Masakata Kanazawa was born in Tokyo. In 1958, he went to Harvard University where studied in musicology under J. M. Ward and Nino Pirrotta. He took the MA in 1961 and then the Ph. D. with a dissertation on the fifteenth-century Vesper music. Returning to Japan in 1966, he taught at a number of universities. In 1970-71, he was a research fellow at the Harvard University Centre for Italian Renaissance Studies in Florence. In 1982, he was appointed the Professor in Musicology at the International Christian University; and he retired in 2004. He has been a contributor to the New Grove dictionaries and the co-editor of the Japanese New Grove Dictionary of Music and Musicians. An introduction to the post-tridentine Mass proper. 2005. Middleton, Wis: American Institute of Musicology. Solesmensibus monachis diligenter ornato. 1931. Paris: Typis Societatis s. Joannis Evang., Desclee. 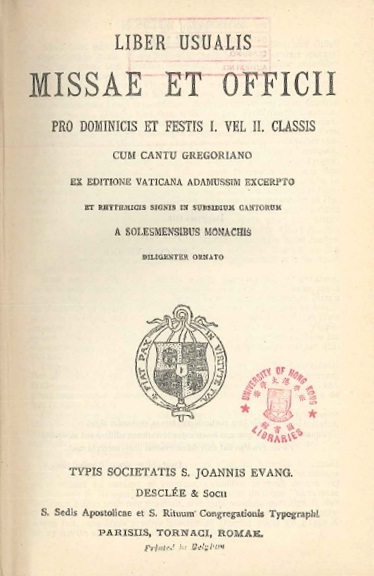 The Gregorian missal for Sundays: notated in Gregorian chant by the monks of Solesmes. 1990. Gregorian chant conveys a calm, otherworldly quality; it represents the voice of the church, rather than that of any single individual. Its rhythm is flexible, without meter, and has little sense of beat. The exact rhythm of chant melodies is uncertain, because precise time values were not notated. But its free-flowing rhythm gives Gregorian chant a floating, almost improvisational character. The melodies tend to move by step within a narrow range of pitches. Depending on the nature and importance of the text, they are simple or elaborate; some are little more than recitations on a single tone; others contain complex melodic curves. Gregorian chant is named after Pope Gregory I (the Great), who reorganized the Catholic liturgy during his reign from 590 to 604. Although medieval legend credits Pope Gregory with the creation of Gregorian chant, we know that it evolved over many centuries. Some of its practices, such as the singing of psalms, came from the Jewish synagogues of the first centuries after Christ. Most of the several thousand melodies known today were created between A.D. 600 and 1300. "Gregorian chants are very diverse in style, with varying approaches to performance, treatment of the text, and melodic character. 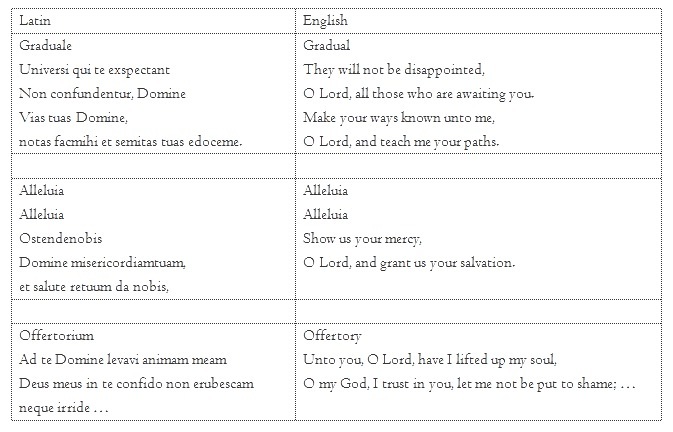 These stylistic differences reflect the disparate functions and histories of the items in the liturgy, and will help guide us through the genres of chant. Singers use three manners of performance for chant: responsorial (from “response”), in which a soloist alternates with the choir or congregation; antiphonal (from Greek for “sound - returning”), in which two groups or halves of the choir alternate; and direct, without alternation. Certain genres of chant are traditionally associated with each manner of performance, although the way some chants are sung has changed over time.